I have NOT collected my paper coupons, can I cancel my ticket? I have already collected the hardcopy of my tickets. Can I Cancel? Why Is My Ticket Non-refundable? The ticket cancellation, modification and refund options described below are a detailed and indicative summary of the policies of the ferry companies as well as of the rights of ferry passengers as defined by the Greek state. These are created and enforced by the ferry operators themselves and not by Ferryhopper. Ferryhopper is not liable for any discrepancy or modification of these options and we recommend that you contact us or the ferry company for a more detailed and accurate answer concerning your specific case. Our customer support team is always keen to answer complex questions, so please do not hesitate to get in touch. Ferryhopper can’t offer any special deals on top of what the ferry companies themselves offer up. If you book through us though, you will, of course, be fully covered by the official cancellation policies of each ferry operator. Here is a brief review of the different cases, but for a comprehensive list, you will have to review the companies’ policies. The cancellation process depends on whether you have already collected the paper coupons of your tickets or not. Please keep in mind that cancellation requests cannot be addressed via phone. You are kindly requested to address your request through My Booking page or through our contact form in case your scheduled departure is in less than 4 days! 3 days to 13 hours before the scheduled departure, cancellation requests are handled as special cases and can be processed only within our working hours. This practically means that in case you contact us at 15.00 on Saturday and your ferry’s scheduled departure is on Monday morning (and hence you are entitled to a 50% refund at that time), the cancellation cannot be processed online. In this case, you will need to visit the local agent of your ferry operator (listed in your booking confirmation document) so that they proceed with the cancellation of your tickets. If you choose to cancel your booking, we will refund the corresponding refund provided by the ferry operator, withholding a cancellation fee of up to 6€ (euros) per booking. Please note that service fees, if applicable, are also refundable. Ferryhopper is operating in EURO (€) and is not responsible if the currency rate at the time of the transaction is different than the currency rate at the time of the refund. If you need to cancel, check and see, and if you’re still confused, please do not hesitate to contact us. According to the ferry operators' policy, you must return the paper coupons of your tickets to any of the following spots in order to cancel them and receive your corresponding refund. The value of that refund will depend once again on each ferry operator’s policy. If you are outside Athens, you need to visit any of the official representatives and collaborating travel agencies of your ferry operator located on the island. You can find the corresponding offices at the collection points link, provided with your booking confirmation email. The agents of the ferry operator need to stamp and cancel your tickets. Once this is done, they are required to either keep the cancelled tickets and refund you or hand to you the cancelled tickets so that you return them to Ferryhopper’s offices in Athens and receive your refund through us. We will, of course, notify you by email as soon as we have received the tickets and have refunded you. If you haven't heard from us after a while and you're a bit worried, you can always get in touch and we’ll gladly help! If you are still in or planning to visit Athens after your trip, you may visit our offices on Patision 25 str., Athens, where you will be assisted and refunded by our team immediately. Some ticket types such as special offer tickets are non-refundable and non-amendable. Also, no refund is provided in case you request a cancellation at a time that does not comply with the ferry operators’ cancellation terms and deadlines. 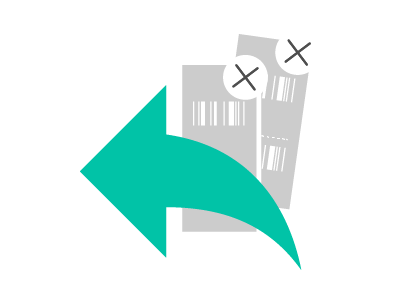 Moreover, no refund is provided in case your tickets are printed and collected, unless you return them to the locations described in our cancellations section. The refund terms of your ticket are governed by the ferry operator’s policy and not by Ferryhopper. Here at Ferryhopper, we try to make these rules as obvious as possible during the booking process. Before you purchase your tickets, you are asked to read and consent with the terms and conditions of Ferryhopper as well as those of the ferry operator; reading these terms is a very important step to understanding the service that you purchase. In any case, regarding non-refundable tickets, Ferryhopper has to stick to the ferry operators’ policies and cannot bypass these terms and conditions. Even if this situation disappoints us, and we lobby the ferry operators to relax their rules, in some cases, we are strictly not allowed to cancel and refund your tickets under any circumstances. We do not have the final say.